Toshiaght blein noa. Ta mee er ngoaill rish dy vel doilleeid ro-lioarys aym. Foddee nagh vel shen jeeaghyn dy ve monney lioaryn, er lhiat? S'doillee eh shen y howse er sooill gyn cosoylaght. Shen mish. Er coontey'n uillin injil, as ny lioaryn lhie rish y voalley, cha nel eh soilshaghey dy cruinn. Dy firrinagh, ta'n carn beggan ny smoo na mish. Shen 6' dy lioaryn meelhaiht. My t'ou fakin nagh vel y carn lioaragh casley rishyn hene 'sy chaslys-soilshey elley: sooill vie. Ren eh tuittym eddyr y jees oc, lesh bwoalley taarnoil, agh bwooise da Jee, cha jagh ad er brishey. Ta kuse jeu feer ard-scoillaragh, as kuse vooar ayns çhengaghyn joarree. Agh ren mee faagail magh beggan ayns çhengaghyn nagh vel ayms foast! Giootyn, bare dou insh dhyt... Lesh cur geill da slaynt, reddyn elley ry-yannoo as y cleaynys aym lioaryn noa y chionnaghey... t'eh foym y carn shen y yiarrey sheese dys 50 lioaryn rish Blein Noa 2014. A new year begins. I've already admitted that I have a problem of book over-abundance. Perhaps that seems like a fairly modest heap of books. There's not much to compare it with, after all. That's me with my books. Because of the angle of the photo, and the books being leaned up against the wall, it doesn't quite give a fair impression. Actually, the pile's slightly taller than I am. 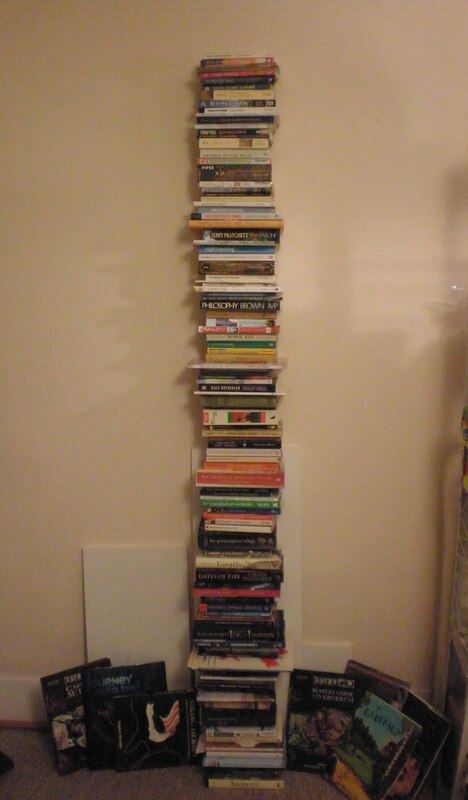 That's 6' of unread books. Quite a few are in foreign languages or very technical. I've left out a couple in languages I don't actually speak - presents, let me add! Bearing in mind health issues, other things to do, and an unquenchable urge to buy more books... 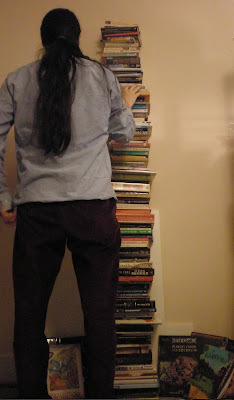 I'm aiming to cut the pile down to 50 books by this time next year.